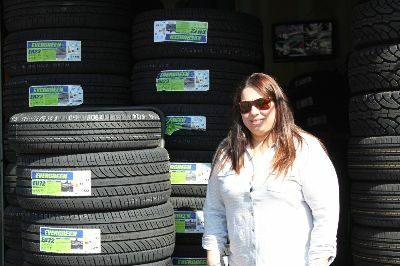 One such member, Maria, took out her first loan from Grameen America in 2011 to rebuild her family’s struggling tire shop. Since joining Grameen and reinvesting in her business, Maria has reported a revenue boost of $1,400 a week, and has been able to hire employees from her community to help out with the increased demand. Most importantly, she has been able to put money away in her savings account toward sending her three children to college. Thanks to Citi, Grameen America’s vision for women like Maria has become a reality. To date, we have invested over $380 million in more than 64,000 low-income women entrepreneurs. More than 15,000 of these women have active Citi savings accounts with total balances of more than $1.7 million. They are creating jobs, increasing their household income, and building better lives for their families. Their collective strength, hard work and determination have brought this organization to where it is today. International Women’s Day is a perfect opportunity to reflect on what we’ve achieved together. 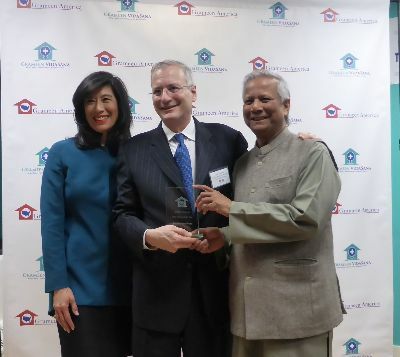 Recently, I was especially honored to present our 2015 Partner of the Year award to Bob Annibale in recognition of Citi Community Development’s and Citi Inclusive Finance’s work in enabling Grameen America to fulfill our organization’s potential and deepen our national footprint. From day one, Citi’s tireless advocacy and commitment has been instrumental to our success. From helping us to identify our first branch location in Queens, New York, to aiding our expansion to Oakland, CA, to introducing innovative technology solutions to our borrowers, Citi has been a critical partner in advancing our mission. While there is still much work to be done to expand financial inclusion to low-income women and further empower our members, our success over the past eight years gives me confidence in our future. I am grateful that Citi has been a key supporter from the beginning, helping us champion the economic needs of thousands of women. Together, we have made strides towards our goal of ensuring that low-income women in the United States have the economic opportunity they need to get ahead. Andrea Jung is the President and CEO of Grameen America. Ms. Jung joined Grameen America with the goal of scaling the organization to solve economic issues for women and their families across the country. She is the former Chairman and Chief Executive Officer of Avon Products, Inc., where she served as CEO from 1999 through April 2012, and as Chairman from 2001 through December 2012. Throughout her professional career, Ms. Jung ranked consistently among the top leaders on lists including Fortune magazine's "Most Powerful Women in Business," Forbes magazine's "Most Powerful Women in the World," and Financial Times' "Top Women in World Business."